A close relative of the leaf insect is the stick insect. While the former mimics a leaf, the latter perfectly camouflages itself as a twig. Both these insects belong to the order Phasmatodea. Belonging to the family Phylliidae and the class Insecta, leaf bugs are one perfect example of camouflage in the wild. Bearing slender and delicate bodies, these bugs are also termed as "true leaf insects". Leaf bugs are also a favorite choice among many pet owners and they do make good pets. It is important to understand that, leaf bugs, although called so by many, are not "true bugs" but insects. Ergo, they are more appropriately known as leaf insects. Why the Name "Leaf Insect"? The limbs and abdomen of a leaf insect are enlarged in such a way that it looks no different from an actual leaf. And this feature is coupled with large leaf-like wings which have veins, making the insect one fine piece of deception. Some of these insects have wings that have brown irregular edges which somewhat resemble bite marks. This helps the insects look like dead or decaying leaves. Note that a male leaf insect has a more pointed abdomen, while a female has a rounded one. Also, males are usually smaller in size than females. Some of these insects can live feeding only on blackberry leaves for their entire lifetime. Leaf insects do not have to worry about drinking water. They can get it from plants. A leaf insect may not have the ability to identify its own type from a mere leaf, due to the 'eye-fooling' camouflage of the insects. Many a time, the insect may be seen nibbling on a leaf which may actually turn out to be another leaf infect. "Look honey... Our dinner looks like our next door neighbor Marty!" Leaf insects molt and when they molt for the last time, it indicates the start of the reproduction phase. Hundreds of eggs are laid by the females in their lifetime and these eggs require a place filled with sand and gravel. 3 - 6 months is the time after which the birth may be expected, and it usually takes place in warmer weather. The leaf insect fools its predator not only by blending in with its environment, but also by the way it walks. When it feels threatened, it swaggers or staggers back and forth giving an impression of a dead leaf being blown away by the wind. Because of this behavior, this insect is also known as "walking leaf". For most of these insects, daytime is the "imposter time". When kept in captivity, if the cage of a leaf insect is too dry, then it may not be able to molt properly. It may also lose a limb because of this. A leaf insect is capable of regeneration. If it loses its limb, then it can replace it the next time it molts. However, once it has reached its adulthood, it can no more replace the lost limb as then it will not be able to molt anymore. 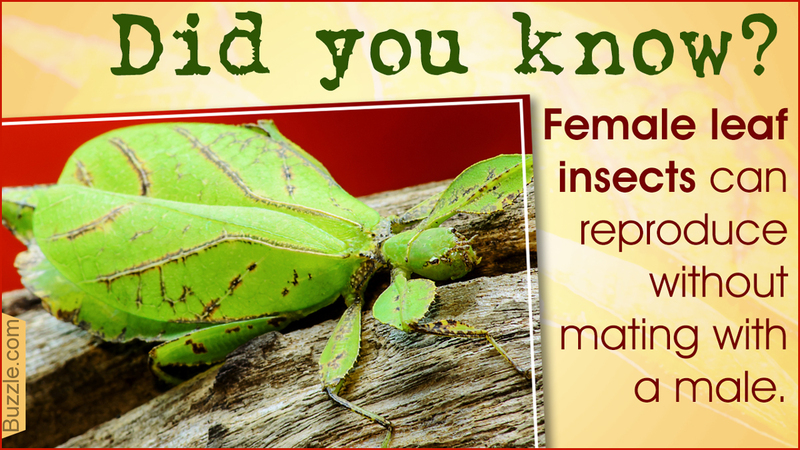 Female leaf insects can reproduce without mating with a male. This process is known as "parthenogenesis". The offspring of this process, however, is only female. If you are giving a thought on raising a leaf insect then take utmost care of its food; do not forget the blackberry leaves - their favorite! These insects, when kept well in captivity, will continue to reproduce for a long time. When eggs are hatched, as mentioned, put them in a container with sand and fine gravel. Misting the leaf insects and their eggs help improve their health. A small aquarium and fresh supply of leaves, would make a perfect 'home-sweet-home' for these masters of deception!